There are two masters in a HAWQ cluster– a primary master and a standby master. Clients connect to the primary master and queries can be executed only on the primary master. You deploy a backup or mirror of the master instance on a separate host machine from the primary master so that the cluster can tolerate a single host failure. A backup master or standby master serves as a warm standby if the primary master becomes non-operational. You create a standby master from the primary master while the primary is online. The primary master continues to provide services to users while HAWQ takes a transactional snapshot of the primary master instance. In addition to taking a transactional snapshot and deploying it to the standby master, HAWQ also records changes to the primary master. After HAWQ deploys the snapshot to the standby master, HAWQ deploys the updates to synchronize the standby master with the primary master. After the primary master and standby master are synchronized, HAWQ keeps the standby master up to date using walsender and walreceiver, write-ahead log (WAL)-based replication processes. The walreceiver is a standby master process. The walsender process is a primary master process. The two processes use WAL-based streaming replication to keep the primary and standby masters synchronized. If the primary master fails, the replication process stops, and an administrator can activate the standby master. 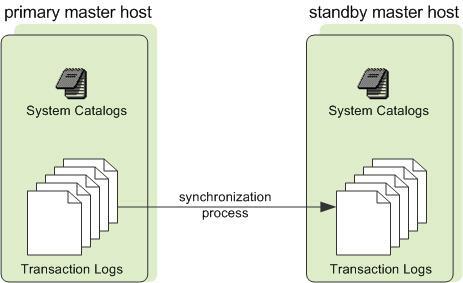 Upon activation of the standby master, the replicated logs reconstruct the state of the primary master at the time of the last successfully committed transaction. The activated standby then functions as the HAWQ master, accepting connections on the port specified when the standby master was initialized. If the master fails, the administrator uses command line tools or Ambari to instruct the standby master to take over as the new primary master. Tip: You can configure a virtual IP address for the master and standby so that client programs do not have to switch to a different network address when the ‘active’ master changes. If the master host fails, the virtual IP address can be swapped to the actual acting master. You can configure a new HAWQ system with a standby master during HAWQ’s installation process, or you can add a standby master later. This topic assumes you are adding a standby master to an existing node in your HAWQ cluster. The gpadmin system user has been created. HAWQ environment variables are set. SSH keys have been exchanged. HAWQ Master Data directory has been created. a. If you use Ambari to manage your cluster, follow the instructions in Adding a HAWQ Standby Master. where <new_standby_master> identifies the hostname of the standby master. Check the status of master mirroring by querying the gp_master_mirroring system view. See Checking on the State of Master Mirroring for instructions. To activate or failover to the standby master, see Failing Over to a Standby Master. If the primary master fails, log replication stops. You must explicitly activate the standby master in this circumstance. Upon activation of the standby master, HAWQ reconstructs the state of the master at the time of the last successfully committed transaction. Ensure that a standby master host has been configured for the system. a. If you use Ambari to manage your cluster, follow the instructions in Activating the HAWQ Standby Master. After you activate the standby master, it becomes the active or primary master for the HAWQ cluster. (Optional, but recommended.) Configure a new standby master. See Add a standby master to an existing system for instructions. The newly-activated master’s status should be Active. If you configured a new standby master, its status is Passive. When a standby master is not configured, the command displays -No entries found, the message indicating that no standby master instance is configured. Finally, check the status of master mirroring by querying the gp_master_mirroring system view. See Checking on the State of Master Mirroring for instructions. To check on the status of master mirroring, query the gp_master_mirroring system view. This view provides information about the walsender process used for HAWQ master mirroring. Follow the instructions in Removing the HAWQ Standby Master to remove the HAWQ Standby Master node. Follow the instructions in Adding a HAWQ Standby Master to re-add the Standby Master. This command stops and restarts the master and then synchronizes the standby.